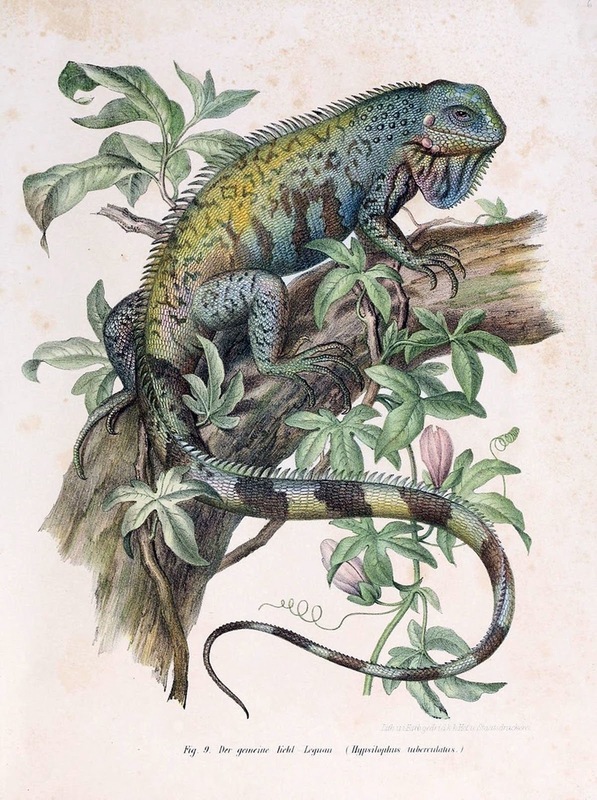 In 2007, a digital library project called the Biodiversity Heritage Library (BHL) was born, providing free, open access to just over 3,000 volumes and 1.2 million pages of biodiversity-related literature. 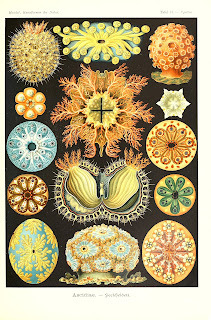 The consortium project, founded via a partnership of 10 natural history and botanical institutions in the U.S. and U.K., was ambitious, embracing a mission to digitize legacy taxonomic literature held within the partner institutions’ libraries and make that literature freely available to the public through a global “biodiversity commons.” Today, BHL has grown into an international project providing access to over 102,000 volumes and 37.9 million pages. The past five years have seen the growth of not only the BHL consortium and collection, but also the platforms on which BHL reaches its community and accomplishes its mission. 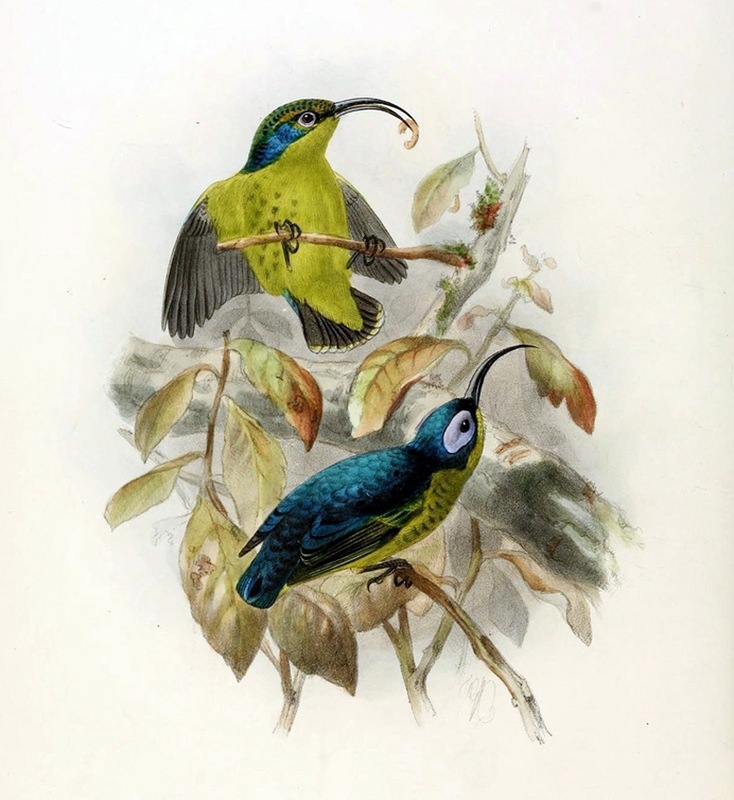 Most recently, BHL expanded its activities to social media and has seen marked success using Flickr to showcase illustrations. 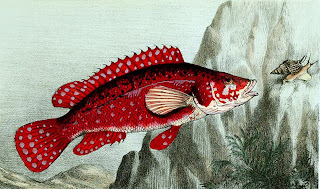 In July, 2011, several members of the BHL staff began putting illustrations from BHL books on Flickr. It started as a simple way to flag favorite staff images and document the illustrations we were using in various outreach activities, like Twitter andFacebook. Today, our Flickr presence has grown to a collection of over 24,000 images and has become one of the most user-celebrated aspects of the BHL project, prompting such statements as “I think I’m in love” and “My favorite Flickr in the whole world!” Several people have asked us to share our experiences using Flickr as a component of BHL and discuss its growth from inception to the success it is now. We couldn’t think of a better place to do this than on our blog. Flickr also allows us to broaden our outreach potential, branching outside of our classic BHL interface and reaching our users on a new platform. The audience using Flickr is often quite different from our traditional user base, thus having a presence on Flickr means that we are able to reach a whole new group of people, including artists and k-12 educators. Our Flickr group has also provided many unexpected benefits to BHL staff. 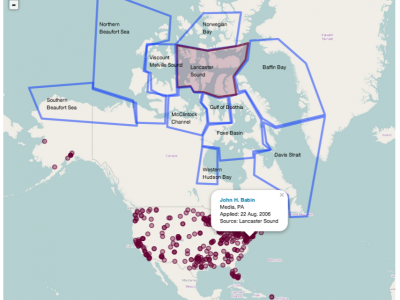 Not only can users more easily find BHL images, but so can we! What started as a way to document those images we were already using in social media quickly became the source of much of this activity. Flickr images provide excellent fodder for our various social media activities, including tweets, facebook posts and trivia, and provide inspiration for many of our Book of the Week posts. Staff can now easily find illustrations to “spice up” BHL promotional materials, including brochures, business cards, banners, and merchandise, or even bring flair to events like donation campaigns. Plus, incorporating images into BHL reports transforms the otherwise boring white pages into alluring, eye-catching documents that people actually want to read. Any time an image from our Flickr photostream is machine tagged, it becomes “flagged” for inclusion into the EOL Group Pool and will thus become a part of EOL species pages. (Images are added to the EOL pool on a monthly basis). See this example of an EOL page for Corvus crassirostris. You’ll notice that the image of the Thick-billed Raven from the BHL Flickr setAlbum of Abyssinian Birds and Mammals is featured on the page. How cool is that?! 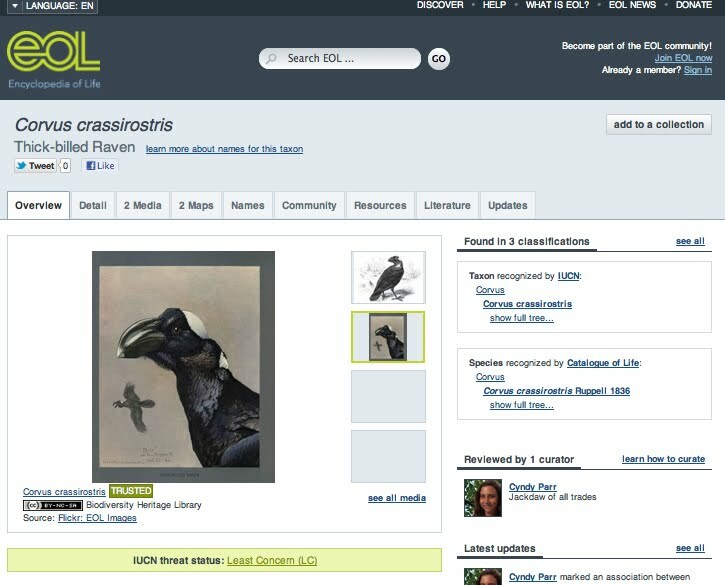 In addition to the links from EOL pages (under the “Literature” tab) to taxonomic name occurrences in BHL, now BHL image content can be repurposed directly onto EOL species pages. We would absolutely love your help tagging more of our images for EOL. For more information about machine tagging, please see the instructions provided by EOL hereand feel free to contact us via Flickr mail, Twitter @BioDivLibrary, or our feedback form if you have any questions. Please note that you have to have a Flickr profile to add tags to BHL images. If you are already a Flickr member or considering becoming one, and would like to have your own images of flora and fauna harvested to EOL species pages, please see the following for more information:http://www.flickr.com/groups/encyclopedia_of_life/rules/. Since the inception of our Flickr group, there have been many project milestones, the first of which (besides actually starting the account!) was implementing a basic organizational structure. 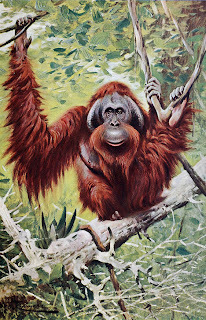 Once it was clear that BHL wanted to fully participate in the Flickr environment, staff transformed a haphazard pool of images into organized sets and collections, with sets structured around individual titles and collections around subjects and content types (like “Mammals” or “Book of the Week“). Slightly later, staff capitalized on the opportunity Flickr offered us to celebrate specific events, organizing themed collections such as Halloween or the Holiday Season. Eventually, staff realized that Flickr could help us target specific content in our collection for metadata improvement – specifically, pagination improvement. Pagination refers to the display of page numbering that you see on the left hand side of the BHL screen when viewing a book. Although very basic pagination is performed at the time of book scanning, BHL staff manually update this pagination with more helpful information such as identifying illustrations, designating articles, and embedding year and volume information. Learn more about BHL pagination in Gilbert Borrego’s post. 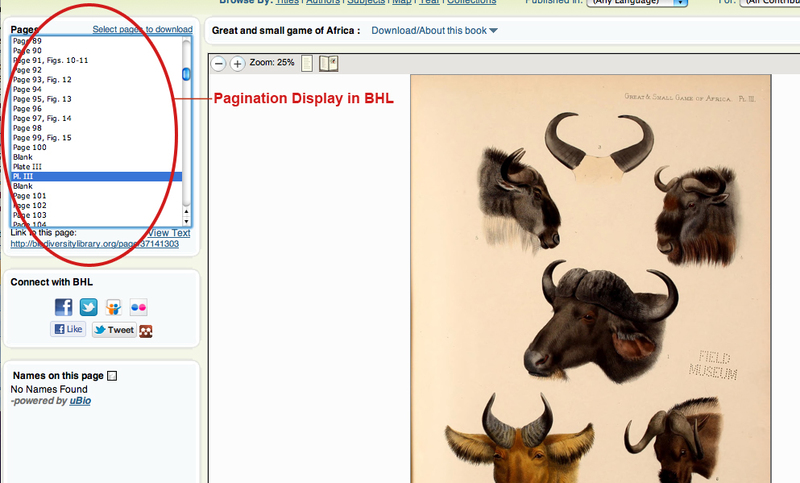 Since those books featured on Flickr became some of the most popular in BHL, and since it was difficult to locate illustrations within these items without improved pagination, staff began to prioritize Flickr titles for pagination improvement. As of this week, all 450+ titles in Flickr have been manually paginated in BHL! Our most recent milestone addresses one of the most common requests we’ve had regarding Flickr content. 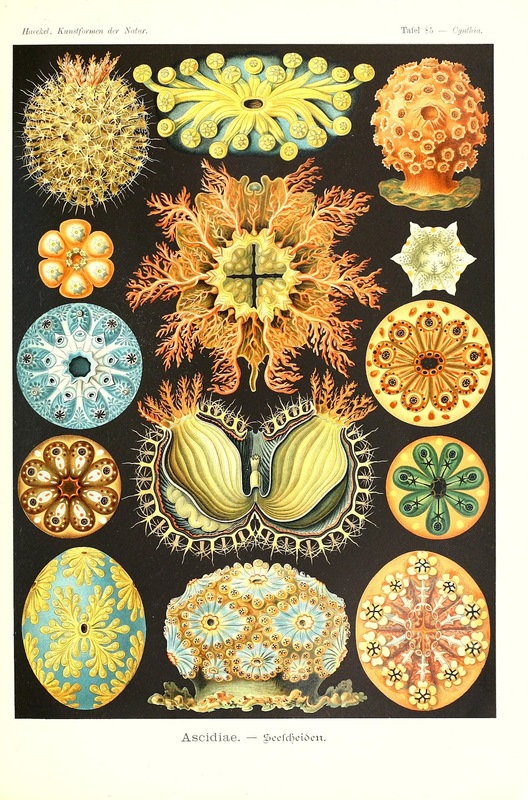 Until recently, images in Flickr only linked back to the volume level in BHL. This meant that the BHL urls associated with an image in Flickr did not link to the specific page in BHL, but instead to the “item” or book that contained the image. It was often difficult to then locate the image within the book, especially if the pagination had not yet been manually updated. Thanks to the Technical Development team at the Missouri Botanical Garden, all images in Flickr now have page-level links associated with them, allowing users to find the page within a BHL book with a single click. 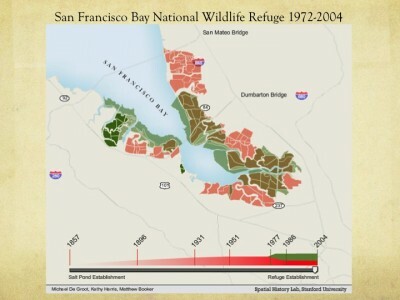 This improvement came with an added benefit for BHL staff. Previously, to upload images into Flickr, staff had to first download the images from BHL, open them in Adobe Bridge to embed metadata, and then bulk upload to Flickr (more on the previous Flickr process in Gilbert Borrego’s post). 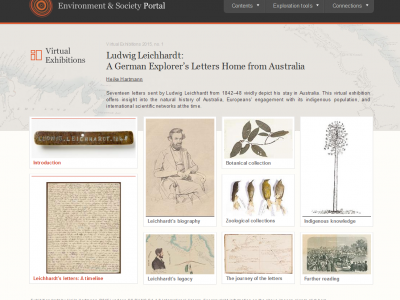 Now, staff can flag illustrations directly within the BHL back-end administration portal. Software developed by the MOBOT team then automatically embeds book and page information to these images and uploads to Flickr. For more information on the technical aspects of these improvements, see our FAQ page. Overall, we’ve found that Flickr offers us an excellent opportunity to provide access to aspects of our content that were overlooked and under-appreciated. 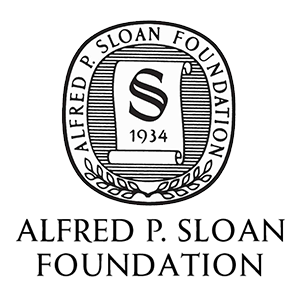 Reaching new audiences and demonstrating that BHL has much to offer outside the realm of taxonomy is a critical step in the growth of the project. 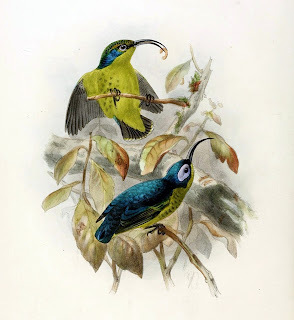 *All BHL images are public domain. However, Flickr does not provide a “public domain” license option. Therefore, our images are listed in Flickr as Attribution, Noncommercial, Share Alike. This post was originally posted at the Biodiversity Heritage Library website.